You'll be £19.99 closer to your next £10.00 credit when you purchase Fighting Napoleon. What's this? It is often forgotten that Britain’s struggle against Napoleon ranged across the continents, and the extensive operations of the Royal Navy and the British Army in the Mediterranean was a key battleground in this prolonged war of attrition. Even when Napoleon considered himself the master of Europe, he was unable to control the Mediterranean. 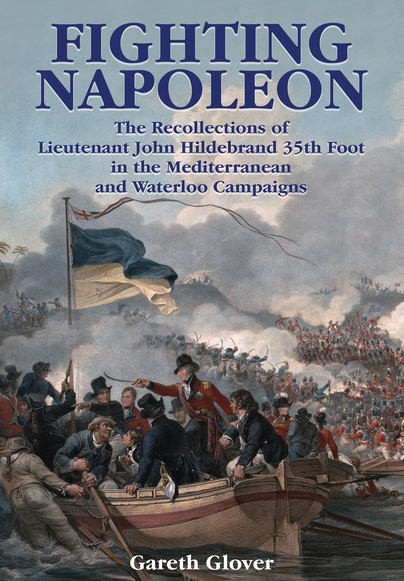 Lieutenant John Hildebrand arrived in the Mediterranean as part of the garrison of Malta in 1810. He was then involved in the defence of the island of Sicily; the campaign to capture the Ionian Islands; the siege of Ragusa, and the Occupation of Corfu. With the war ending in 1814, John and his regiment returned home, only to be sent to Belgium when Napoleon escaped from Elba in 1815. The regiment was not involved at Waterloo, but was at Hal which guarded Wellington’s flank during the battle. He then marched to Paris with the army. These lively and entertaining memoirs, edited and annotated by renowned historian Gareth Glover, are certain to find a wide readership amongst Napoleonic enthusiasts, providing an intriguing counterpoint to Wellington’s operations in the Iberian Peninsula. Essential reading for military historians and collectors of Napoleonic War era artefacts and militaria. As the book jacket notes, it is often forgotten that Britain’s struggle against Napoleon ranged across the continents and the extensive operations of the Royal Navy and the British army in the Mediterranean was a key battleground, for even when Napoleon considered himself to be master of Europe, he was unable to exert control over the Mediterranean. Lieutenant Hildebrand arrived in Malta in 1810 as part of that island’s garrison. He was subsequently involved in the defence of Sicily, the campaign to capture the Ionian Islands, the siege of Ragusa (Sicily) and the occupation of Corfu. When the fighting ended in 1814 Hildebrand and his regiment returned home only to be sent to Belgium in 1815. Being stationed at Hal guarding the flank of the Allied army, the unit was not involved in the fighting at Waterloo, but marched to Paris with the army. The memoirs have been edited and annotated by historian Gareth Glover and provide an interesting view of Napoleonic warfare away from the Iberian peninsula. Following a foreword by Gareth Glover, the text is supported by five maps, 16 monochrome illustrations and there are five appendices, a bibliography and an index. Napoleonic students will enjoy this refreshingly different slant on Napoleonic warfare.